I will admit that part of the drive to shoot the Indiana State game against Bradley was to see Carver Arena in person. I love an arena with a little identity to it, and this one had that for sure. 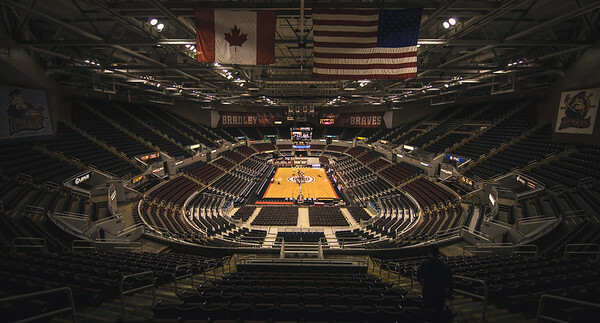 If you stood on one end of the arena and faced back at the court you were treated to a small history of the Bradley Braves basketball program. The other way had the Peoria Rivermen signage up. I was at the game early so I decided to go up and make my arena photo. In the old days getting to the arena two hours or more early for the game would get you an empty court. Now for some reason someone is always on the court doing something. This was made over two hours before the game started, and still I had to try and wait out people on the court. I still like my empty arena pictures from new places though. I try to get these at every new arena that I visit. I would like to get this with a full stadium, but I am usually a little busy when it is full. This weeks edition of my favorite photos is basically a recap of my four games in five days with the men’s and women’s basketball programs of Indiana State. Four wins makes for some fun photos. This week I still don’t have final plans for yet, but I do know at some point I will be in St. Louis for the Indiana State game Friday. The way that the schedule is looking right now this might be my last week of basketball so I had better enjoy it. You can view my favorite photos from last week here.